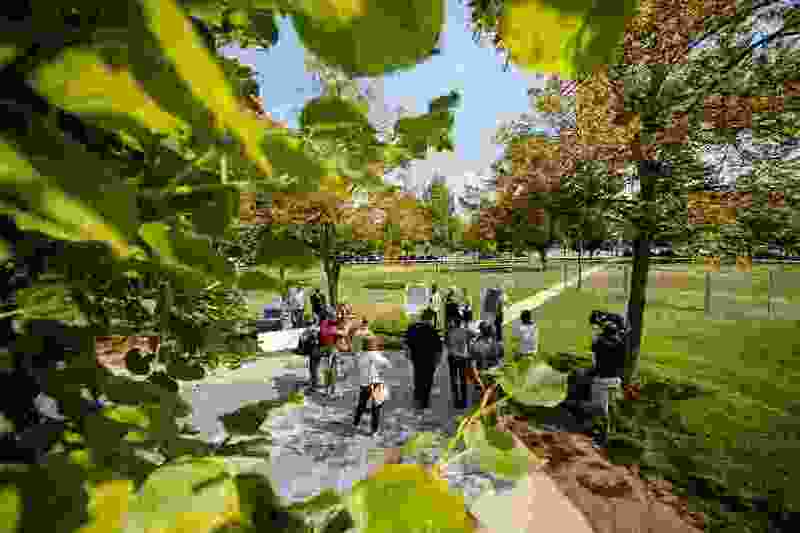 (Trent Nelson | The Salt Lake Tribune) A news conference in Salt Lake City's Pioneer Park addressing the collaborative construction of a multi-purpose field by the Pioneer Park Coalition, Salt Lake City Parks, and the Salt Lake City Resource Development Agency, Wednesday Aug. 1, 2018. Pioneer Park is getting a facelift, thanks to help from Salt Lake City and a group of developers that’s working to make the downtown park more of an attraction. The park will soon be home to a new, lighted grass field slightly bigger than a soccer pitch that takes up about a third of Pioneer Park at its southern end. The park, which is less than a half-mile from the city’s emergency shelter, has been a focal point for homeless residents for years. City leaders contend drug use and crime has also kept the park from being used by all residents. The field is estimated to cost just short of $1 million, with about a third coming from a group called the Pioneer Park Coalition. Gail Miller gave much of the money behind the private donation. The new field will include lights, a 10-foot concrete path around the perimeter and lights along the path. The city will remove the existing bathrooms, which have been long out of commission. It will also take out the existing trees within the project area, which a city spokesman said were in poor health and were a species that’s susceptible to disease. Two-dozen sycamore trees will be planted to ring the new field. “We will soon be able to host youth sports, after-work leagues, weekend ultimate Frisbee games, and, hopefully, a Thanksgiving Turkey Bowl,” Biskupski said. Matthew Rojas, a spokesman for Biskupski, said the field would be free to use. The city has already fenced off the area but said construction won’t impact the two weekly farmers markets that are held in the park through the fall. 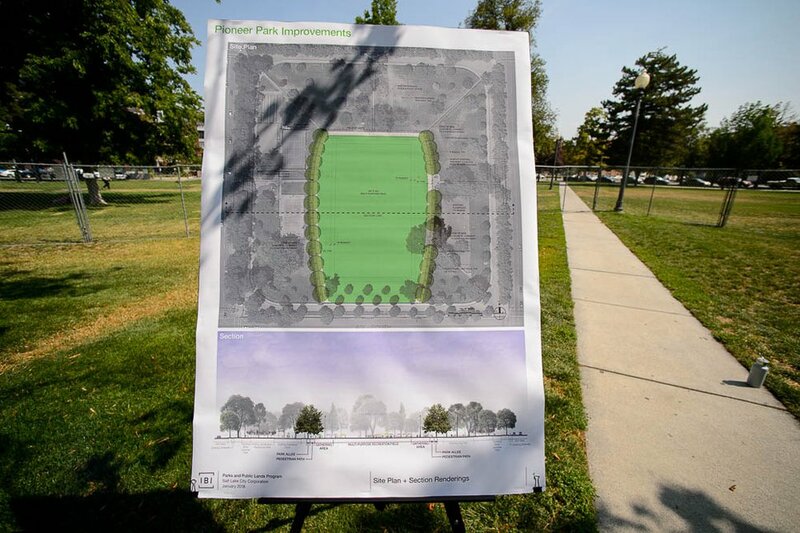 (Trent Nelson | The Salt Lake Tribune) Plans for a multi-purpose field in Salt Lake City's Pioneer Park. Wednesday Aug. 1, 2018.